My first impression when reading the french name Jardin de l'Évêché was "yikes... too many accents... How should I read this!" As my poor french pronunciation always become the biggest amusement to my kids, I pass the phrase! Well, it's a matter of a name... 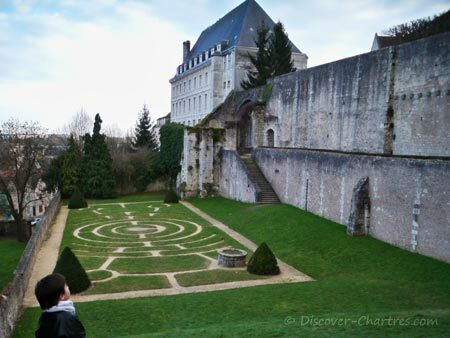 I'd love to call this garden as Chartres cathedral garden or Jardin de la cathedrale, as locals use to call it this way - easy pronunciation and fit with its location, which is in the backyard of the cathedral. The palace is now served as Fine-Art Museum as you can see today. Don't bother to search where is the palace! 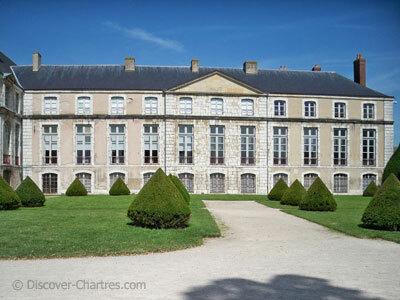 I've mentioned earlier in this page that the Bishop’s Palace now is used as a museum - Fine-Art Museum. It was Bishop Léonor d’Estampes who destroyed several old buildings and built the terrace and its retaining wall in 17th century. 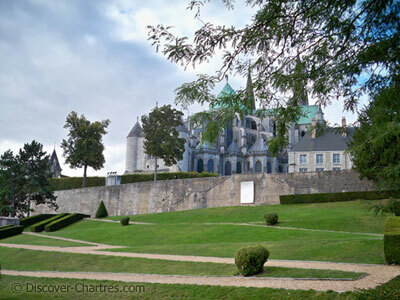 His successors then created the maze garden on the lower part of the terrace. The Bishop’s Palace garden has classified as a historic monument in 1941. In general, the garden opens daily from 8am to 8 pm. Many people come here just to chill out, sun-bathing on a sunny day. Often I see people come here to have their lunch. If you were in Chartres during the Chartres Light Show, which is usually on April to September, visit the garden at night with colorful lights could be the best moment. You can see also the illumination on the facade and the backside of the Fine-Arts Museum walls. The garden gates of course open until late at night for the Light Show event.